We have ways of making you talk.. 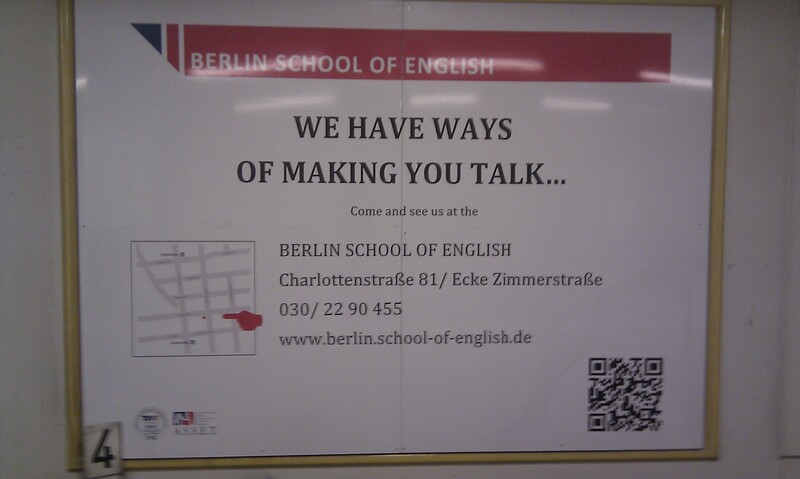 Taking the U-Bahn and getting off at Kochstrasse on the U6 near to Checkpoint Charlie, I noticed the attached poster for the Berlin School of English. It made me smile, remembering the British cliche of the German interrogator in WWII films saying in a clipped, teutonic accent ‘Vee have vays and means of making you talk..’ The thing is this maybe amusing for me but would it be amusing to the people the school is trying to attract i.e. Germans wanting to improve their English? Probably not. The sentence may not be complex, but its implied message is likely to be lost on a German audience: the familiar ring of ‘We have ways of making you talk’ is not heard by an audience who see their movies dubbed into their own language. They may have heard the sentence as many times as their English counterparts, but only in its German wording. What may be amusing to one culture, may, for very good reasons, fall flat in another. Germans don’t lack the humour (that other, well-worn stereotype) to understand it; it just doesn’t mean the same to them. Simon Anholt, an expert in international communications, observed in his excellent book ‘Another One Bites the Grass’ (the German equivalent of the saying another one bites the dust) that advertising is not made of words, but of culture. This poster ad is made of British culture, and needs a British audience (or someone familiar with its tastes) to decode it – which is hardly its intended audience. Communicating in a culture different from your own requires awareness of the all-important differences. Otherwise the message risks becoming muddled, confounding, or even offensive. Anyway, I understand from a good friend who has worked at the school as a teacher that they do good business, and have done so for many years. So it would seem that they do, in fact, have ways of making people talk.